After an incredible outpouring of emotions the caregiver experiences an immediate sense of relief when they first learn they are not alone. Will persons living with Alzheimer's become an empty shell? Become a shell of themselves? Become unable to communicate in any way, shape, or form? Ouch, the last one hurt when I typed it. Back in 2005 after my awakening, after my incredible moment of inspiration, I started writing down all the bad things that I thought could happen with Dotty and me. I did this with the express intention of getting myself mentally prepared for the day(s) when the bad stuff would happen. Mentally prepared in advance. These led me to write a series of articles I later republished (several times) here on the Alzheimer's Reading Room. This article received some of the most heart wrenching and gut wrenching emails I ever received here on the ARR. New emails continue to come in from newly born caregivers that find the article via search, support groups, or social media. It still amazes me when a caregiver that has been forgotten, or abandoned, reads the article and then after an incredible outpouring of emotions, experiences an immediate sense of relief that they are not alone. We the caregivers are every where. 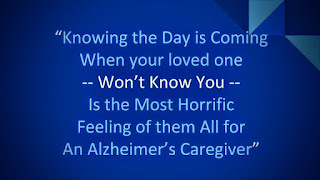 Even though as dementia caregivers we often become invisible. which was about how lonely it can get sitting in the front row all by yourself as a caregiver; and, how difficult it can be. I thought some of the family members and friends of dementia caregivers would read it and rally to the aid of the caregiver. It has not worked as well as I had hoped. Which brings us to the point of this article. 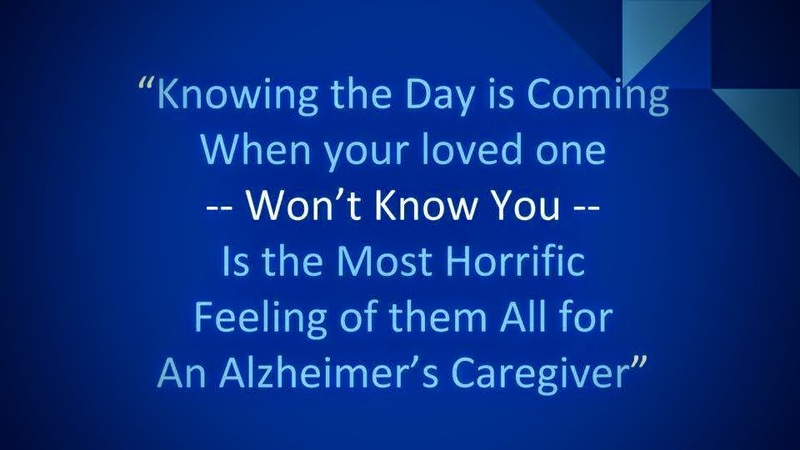 Are you worrying or thinking about the day when your loved one will no longer know or recognizing you? Are you trying to deal with this issue and get mentally prepared in case it happens to you? The goal of the Alzheimer's Reading Room is to help everyone to better understand, cope, and communicate with a person living with dementia.